withdraw Rabindra Nathan as Counsel, instead here is where the scandal is: Rabindra Nathan continues to appear before the same judge on the same case and behaves as though nothing has happened. Johan Raslan knows this is manifestly wrong but chooses to play along. As a result of the discovery application being dismissed, PwC Malaysia then attempted to introduce fabricated documents and the leave application for contempt was because of that. 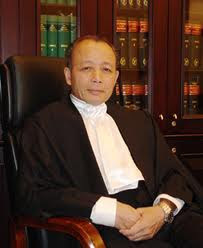 Chief Justice Tan Sri Ariffin Zakaria. Learned Chief Justice, shouldn't discovery application for documents be automatically granted to ensure a fair trial? Justices of the Court of Appeal Datuk Abdul Wahab Patail and Justice Hishamuddin Yunus. In fact in 2005, Justice Hishamuddin Yunus fixed trial dates for this case. Against all odds, PwC Malaysia's counsel obtained a stay of proceedings from the Court of Appeal, pending their appeal to strike out the suit. Hence Justice Hishamuddin Yunus was unable to proceed and hear the case. PwC Malaysia successfully managed to stall proceedings for a further 5 years. on Johan Raslan's instructions, withdrew the appeal and were ordered to pay costs to the plaintiffs. favourite to take over as Securities Commission Chairman in April 2012.